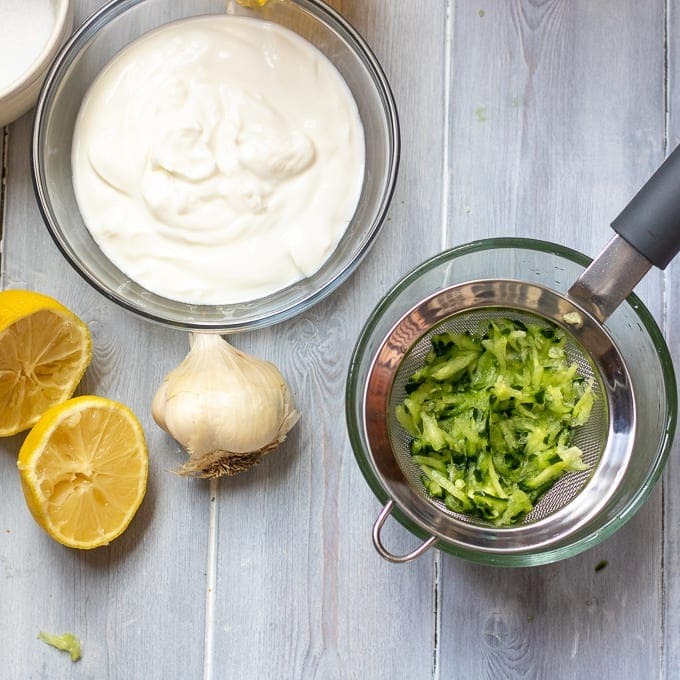 This delicious Homemade Tzatziki Sauce is full of delicious Greek flavors and is a perfect compliment for meat, veggies or to use as a dipping sauce. This classic Greek recipe is healthy and easy to make. I love Mediterranean food. I love Mediterranean restaurants, recipes, and I would LOVE to visit the Mediterranean Coast. 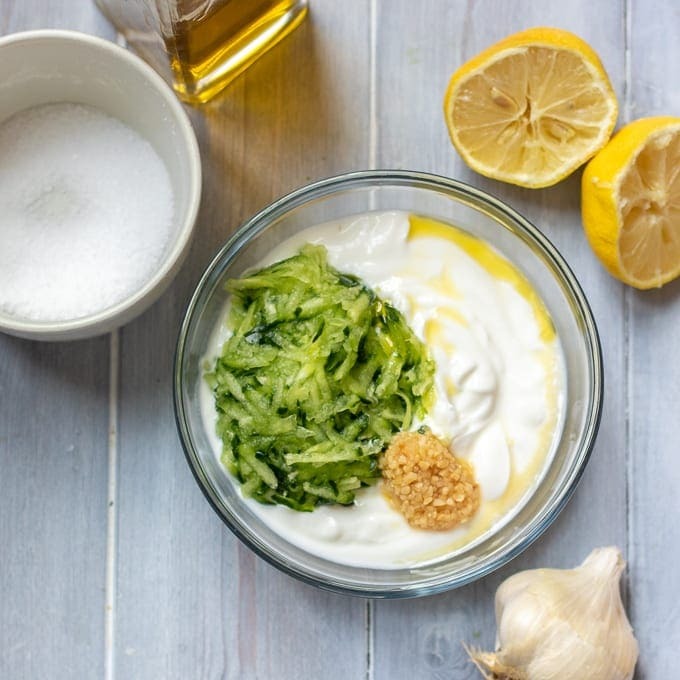 While I do not have travel plans to Greece any time soon, I will not stop myself from enjoying one of my most favorite Greek recipes, Tzatziki Sauce. Tzatziki Sauce is a Greek sauce that is made with yogurt, cucumber, dill and garlic. I first was introduced to this Greek sauce, when my parents would order gyros out. My mom also served Tzatziki with Indian curries to cool down the dish. That is not a traditional way to serve this cucumber yogurt sauce, but I did NOT complain. 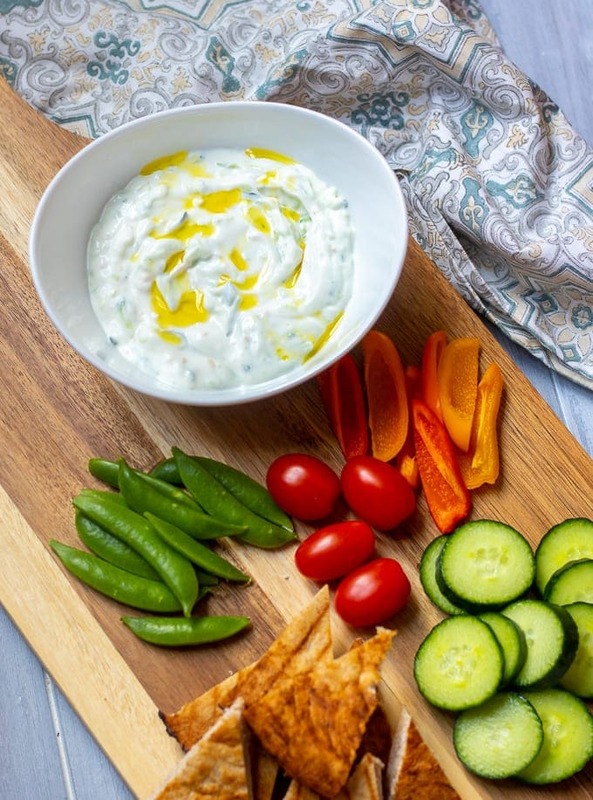 Now, I love to make Tzatziki to serve as a dip for raw veggies, warm pita, and of course to serve alongside homemade gyros, grilled meats, or curries. If using a garden cucumber, peel and seed. Grate the cucumber on a box grater or in a food processor fitted with the grating blade. Place the grated cucumber in a mesh strainer over a bowl. Sprinkle the cucumber with 1/2 teaspoon salt and let sit for 10-15 minutes. Place the cucumber in cheesecloth and wring out any excess liquid. Alternatively, you can press down on the cucumber in the strainer with a spoon or glass to remove the extra liquid as well. In a mixing bowl, mix together the yogurt, garlic, dill, olive oil, salt, and cucumber together. Cover the Tzatziki sauce and refrigerate for at least 60 minutes before serving. Remove the Tzatziki from the refrigerator and place in a serving dish. You can use either an English cucumber (seedless) or regular garden cucumber. If using garden cucumber, be sure to peel and seed before grating. I think it is best to grate fresh garlic cloves over a microplane, to avoid large, unpleasant chunks of garlic. Dill is optional, but traditional. When serving Tzatziki with curries, I typically omit the dill. You can prepare the Tzatziki sauce up to 3 days in advance. When doing so, I prefer to wait to stir in the grated cucumber into the sauce until 1-2 hours before serving. Non-fat, whole milk, or 2% plain Greek yogurt are all suitable for Tzatziki. For an authentic, luscious sauce, I advise using whole milk yogurt. This is an easy Greek dip made with yogurt, dill, lemon and garlic. This Homemade Tzatziki Sauce is a perfect compliment to meat, veggies or served as a dip. 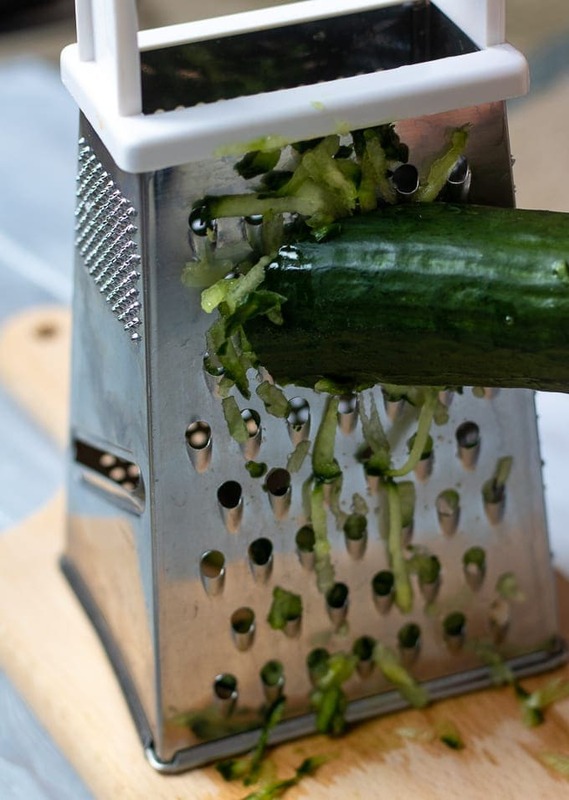 On a box grater, or in a food processor, grate the cucumber. Place the cucumber in a mesh strainer and sprinkle with 1/2 teaspoon salt. Allow to sit for 10 minutes, for the cucumber to release some of it's water. Place cucumber in cheese cloth and squeeze out any excess liquid. Alternatively, you place the cucumber in a mesh strainer and use a cup or spoon to press the excess liquid out of the cucumber. Mix together the yogurt, garlic, remaining salt, olive oil, lemon juice, and dill together until well combined. Gently stir in cucumber. Refrigerate for at least 60 minutes before serving. When ready to serve, drizzle with olive oil if desired. Homemade Tzatziki Sauce will keep in the fridge for 2 once cucumber has been added.